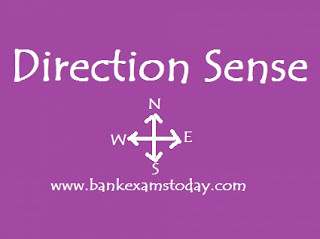 Direction Sense test is an important chapter from examination point of view.Today I am providing shortcut technique to solve these questions quickly. Distance and direction is the measurement of position of an object or thing with respected to another one. In the exams, a successive series of directions is formulated and the candidates is required to ascertain the final direction and the distance between two points. Direction is a measurement of position of one thing with respected to another thing. Displacement is the measurement of distance between initial and the final point. There are four type of directions, viz. East West North and South. Sun rises in the East. Just opposite of East is West and South is in the opposite to North. Abbreviations for these directions are E (East), W (West), N (North) and S (South). A direction between two main directions is called cardinal direction. Clearly, there are four cardinal directions. We should use the diagram as given in question for the purpose of sensing directions. The distance from a point is ‘P’ in horizontal direction and a distance of ‘Q’ in vertical direction is equal to . a) If a person facing towards Sun, the shadow will be towards his back or in west. b) If a person facing towards South, the shadow will be towards his right. c) If a person facing towards West, the shadow will be towards his front. d) If a person facing towards North, the shadow will be towards his left. a) If a person facing towards Sun, the shadow will be towards his back or in East. b) If a person facing towards North, the shadow will be towards his right. c) If a person facing towards East, the shadow will be towards his front. d) If a person facing towards South, the shadow will be towards his left. Note- At 12:00 noon is no shadow because the rays of the Sun are vertically downward. In this type of questions, we have to ascertain the final direction with respected to the initial point or the directional relations between two points/things. Example 1. A man is facing towards West and turns through 450 clockwise, again 1800 clockwise and then turns through 2700 anti-clockwise. In which direction is he facing now? Finally on moving 2700 anti- clockwise, he faces in the direction OS which is South-West. In this type of question, we deal with the final distance between starting and final point or between two points/persons/things. There are various formats/patterns of displacement. Example 1. Mayank walks 20 m North. Then, he turns right and walks 30 m. Now, he turns right and walks 35 m. Now, turning left, he walks 15 m. Again, he turns lefts and moves 15 m. Finally, turning left he again walks 15 m. In which direction and how far is he from his original position? Also ‘F’ lies to East of ‘A’. In this type of questions, we deal with the final distance between starting and final point of any person/object/thing. There are various formats/patterns of distance and direction. Example 1. A tourist drives 10 Km towards East and turns to the right hand and drives 3 Km. Then, he drives towards West (turning to his right) 3 Km. He, then turns to his left and drives 2 Km. Finally he turns to his right and travels 7 Km. How far is he from his starting point and in which direction would he be? His final point is F which is in South direction from starting point A.